Reports from the Democratic Republic of the Congo indicate that a recent Ebola outbreak has been stopped with comparably few deaths. In parts of West Africa, however, fear ­— and the disease ­— continue to rage. So what’s different in the Congo? Does it have a more robust health-care system than, for instance, Sierra Leone, where an outbreak shows no signs of slowing down? The Congo has a tradition of community involvement embedded in its health policy since at least the 70s. It is this that is at the centre of its effective dealing with the virus, according to some who have and continue to work in the Congo. Since the virus was first named in 1976, the Congolese have managed to contain seven Ebola outbreaks. That’s the word from this video report by Dr. Malonga Miatudila, a former World Bank public health specialist who was among the pioneers of the response to Ebola in that country. None of these previous outbreaks lasted more than 100 days ­— and none had the number of deaths reported for the latest West Africa outbreak. “We equipped communities with the facts and then, after informing the communities, we engaged with them in establishing measures for how to control the disease,” says Malonga. Jean-Louis Lamboray is a former World Bank public health specialist and co-founder of UNAIDS. He is concerned that the Congolese experience is not being taken into account. “The current response in West Africa based on quarantines and hospital care might contribute to the spread of the virus,” he says. 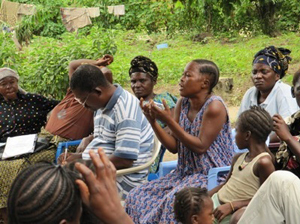 A gathering in the Congo intended to enable a community response. A CBC article on Oct. 17 reports that the World Health Organization has admitted that it botched attempts to stop the now-spiraling Ebola outbreak in West Africa, blaming factors such as incompetent staff and a lack of information. But if the international community is truly interested in stopping this virus, finding who’s to blame can’t be the focus at this point. Instead, let’s use well-tested approaches to partner with local communities so they can be the ones to control the disease, with health services and the international community providing support. To learn about a community-centred approach to Ebola, visit this page.